The abbreviation "A&A", need not in any way be considered offensive; it's just an acronym. In order to save time, have used terms like "the B/V hypothesis" (where "B/V" = "Bonomi/Virtuani" ) myself, and can assure you no offense was intended. I honestly did not know what "D&S" referred to, which is why I asked. I am not sure that the usage is optimal, insofar as so far as I know, these two have not presented any formally linked position, and are apparently only two representatives of a larger number of individuals holding similar -- though probably by no means nearly congruent -- positions. I suppose we could use "H/D", for "Hooligan Deniers", a term popularized some time ago, but this seems a bit offensive and judgmental, as it implies 'off the bat' that the position, however articulated, is inherently incorrect. "A/A1" or "B/V"1: That Mr. Bonomi's reconstruction of the Denmark Strait action is sufficiently accurate to be considered definitive. "A/A1" or "B/V"1: That historical evidence is sufficient to justify claims of ineptitude/cowardice on the British side during the Bismarck Chase. "GC2" or "CI2": That historical evidence is insufficient to justify claims of ineptitude/cowardice on the British side during the Bismarck Chase. "The abbreviation "A&A", need not in any way be considered offensive..."
as well as the "D&S", but I still would prefer to be addressed with my name in case anyone has something interesting to say to me (and not only denying the evidence). Let's speak naval history here, if possible, please. "as so far as I know, these two have not presented any formally linked position"
Yes, they did. They are the (hopefully) only ones to still insist that the splashes are 15" shells from Hood. there is no other logical conclusion than the one they were from PoW local salvos. " Last edited by Alberto Virtuani on Sat Apr 13, 2019 9:21 pm, edited 5 times in total. Let's confine the discussion to the relative distance of the shell splashes to PE and Bismarck. The first shell splash measures 306px high while Bismarck's mast height is 90px. The shell splash is obviously not on the same relative plane as Bismarck. I would expect that a 15in shell splash would be about the same height as Bismarck's mast if it and Bismarck were at the same distance. 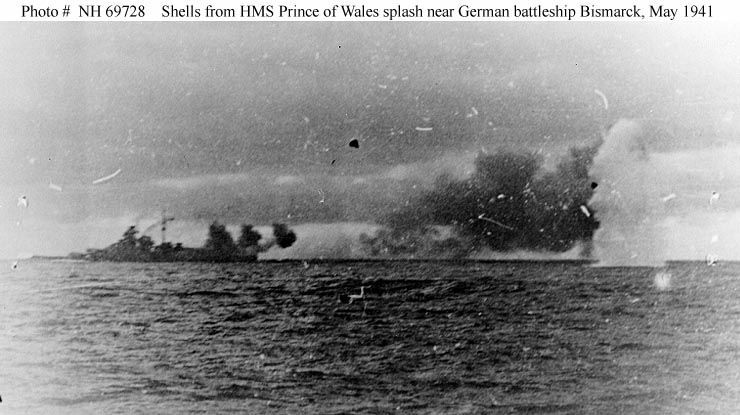 Dunmunro wrote: ""The first shell splash measures 306px high while Bismarck's mast height is 90px. The shell splash is obviously not on the same relative plane as Bismarck"
No doubts about this fact, as no doubt the splash is not on the same relative plan as PG as well, I guess... So what ? What is the calculated distance from PG and BS then? What geometrical method has been used? What about the second splash? Just tirelessly repeating that the splashes look possibly closer to PG, will simply prove nothing at all (viewtopic.php?f=1&t=8526&start=15#p82815). If this is correct, then the second splash, so much less higher vs BS mast (download/file.php?id=3251) is surely at more than 2/3 of the same way (evidently closer to BS than to PG), confirming that Alwin was adjusting his fire against the flagship. 4) the first PG turn to starboard (around 06:04 on her battlemap http://www.hmshood.com/history/denmarks ... tlemap.gif) is well visible analyzing the start of the film (see an easy explanation here: viewtopic.php?f=1&t=8491&start=435#p82759): at that time only local control was active on PoW and Hood had already gone since a while. After reading the discussion in this thread with interest, I have got a few new questions. How high do you approximately calculate the splash to be? Would a 15" shell splash look much different in size compared to the 14" in the photo? At last we have some acceptance and therefore consensus that at least one of the splashes is closer to PG than to Bismarck. What they saw was this. the enemy was raising the four guns of his sole after turret two at a time, was firing and then lowering them again to the loading position. At the same time he slewed suddenly to port only to turn back again immediately afterwards just as hard to starboard. "It can only have come from the Hood" confirmed Capitan Brinkmann. "The battleship never fired at us but only at the Bismarck. I just wanted it confirmed. Thank you." If a shell lands closer to you than anything else around it is "clearly and logically" reasonable to think it was fired at you, rather than anything else. If you are observing the minutiae of the enemy's firing technique, you would surely notice if the shells you actually saw fired came at you. Since the only ship surviving to fire at the Germans at all at the end of the engagement was the battleship and Brinkmann says the battleship did not fire at PG at all, this is clear. Brinkmann, Busch and Langemann all say these splashes are from Hood. Therefore reconstructions that deny this are incorrect. Guesstimates based on interpretations of PoW's closing rate are just that. For Daniel I suspect there is certain amount of randomness in shell splash size depending on angle of fall, impact with a wave front or otherwise, and prevailing wind strength breaking up the spray more quickly or slowly. These are AP shells which may have fuse delay activation on hitting the water resulting in subsurface explosion some distance away or not. The fuse may not activate at all, as several did not even after hitting steel. PG was firing HE shells which might be expected to explode on water impact, creating a big splash for their calibre. As co-authors I believe Dulin and Garske don't complain about being referred to as G&D, although there might be confusion with a fashion house if it were the other way around! However, geometry, timings, speeds and courses (no guess-estimation in the PoW salvo plot...) are much more important than wrong statements [material redacted wjj] (except using a wrong 1943 battlemap...). Bracer wrote: "Would a 15" shell splash look much different in size compared to the 14" in the photo?" I don't think anyone can distinguish between the two of them: the British 14" AP shell contained more explosive charge (22kg) than the German 15" shell (18,8 kg), therefore I even suspect that its splash would have even been able to cause a larger water column, in the same conditions. As far as I recall, Antonio has refused to be drawn on whether there is any annotation on the print which can be directly linked to Langemann. The Bundesarchiv says the wording was "on or with the original material", therefore not created by their archivist. This should be noted. Antonio has described his handling of the original prints stored by the Bundesarchiv, but when asked directly whether there was writing on them and whether he recognised it as Langemann's I believe he refused to answer. I have no doubt he considers this to be proprietary information to him, and it would remain so until somebody else visits the Bundesarchiv and this information passes out of his control. Until this matter is cleared up it is possible to claim that it is a comment made by somebody else. If Langemann is subsequently identified by signature or even handwriting, then those promoting their theory will have to fall back on suggesting Langemann, like Brinkmann and Busch didn't know what they were talking about, and couldn't tell which ship was shooting at them, even when they saw the enemy's guns reloading and firing. Or were lying for propaganda purposes. If PG's shells exploded at or near the surface whereas Bismarck's dived underwater intact, how big the bursting charge is would be immaterial. Since we do not know what delay base fused HE shells fired by PG had, in anticipation of engaging a tin-clad 10,000 ton County, we do not know how close to the surface they exploded. We know at least one of Bismarck's shells failed to explode at all, lodging in PoW's vitals. I thought we were moving away from underlining. So far as the height of shell splashes is concerned, having observed a few, I think it would be fair to say that they tend to be reasonably constant from shell to shell, but that the general average height seems to vary a bit depending upon conditions. So 'high' splashes might be common one day, with relatively 'low' splashes another. Another variant revolves around the explosion (on non-explosion) of the explosive charge, and the time delay between impact and explosion. The shape and size of the water column is closely related to the depth at which the explosion occurs, though by no means inversely proportional. (This has to do with bubble-pulse timing and other issues.) There are, of course, other difficulties as well, insofar as it's often unclear at exactly what point in the water column the image was being made, so a still-growing splash from a bigger shell might appear to be the same size as a completely formed splash by a larger one. If more information about the photo was provided, it should, in principle, be possible to refine the splash distance considerably insofar as it is, photogrammetrically, independent of the image of Bismarck. The techniques to impose this sort of analysis are quite straightforward -- at one time I taught them using what by now would be considered fairly stone-age technology -- but one does have to know a bit about the camera and the initial alignments of the image. This would usually require, at the very least, a full-frame print of the negative, without any cropping. It is unlikely that we have this here, as it is not even clear if the negatives still exist. So far as the single splash is concerned, it is quite possible that it represents a single 'wild short' from a larger salvo. There are many reasons for a single shell to fall well outside the main pattern. Sometimes the projectile suffers a dislodged windscreen, which greatly increases drag, is 'kissed' by an adjacent projectile in flight, or ends up locked in a particularly turbulent part of the atmosphere downstream of a projectile just ahead of it. There are other reasons as well, of course; most commonly, a single gun is fired at an incorrect elevation due to human or mechanical error, or a gun might be fired with a partial propellant load because of some sort of difficulty in loading. If the salvo is the first of the day, there are often quite a few unusual discrepancies that might be added to this, e.g. a gun-tube partially filled with ingested water, which might occur if a gun were loaded and 'ready to go' five or six minutes before the actual engagement commenced. A foot-long slug of water in a gun tube 15" in diameter would weigh about 80 lb (36kg). Sometimes in combat a tampion must be removed by firing through the muzzle. Not recommended, but can usually be done, and is usually 'designed in' to the system. At any rate, seeing one projectile out of a multi-gun salvo well out there all alone, though somewhat unusual, is by no means remarkable. I would remind members again to take care with phrasing and the inclusion of unnecessary emphasis in the form of emojis, bolding, underlining, etc. in postings. I do the best I can to edit the worst of this material out, but it is time-consuming, and as inappropriate phrases are often intermingled with cogent commentary, it is often difficult to delete offensive material while still retaining the apparent meaning of the text. As before, should this continue, I will commence deleting posts entirely -- which is a shame because it is rare to find a post completely without merit -- or taking more serious action. The first splash at 5:56 is quite probably part of a larger salvo but the other splashes are hidden from us - this is quite consistent with PE being the target as the splashes, being nearer to her would necessarily be harder to capture when the camera is trained on Bismarck. The 2nd splash at 6:15 is at the far left of the frame, and again it might have been part of a larger salvo, and indeed, at 6:25 we see another water column, further left, in the final stage of collapse. The observation that "...The camera appears to have fairly high magnification and a narrow field of view" is probably correct. Normally negatives are (or perhaps more correctly, were) 'cropped' in printing, enlarging only a portion -- usually the most interesting portion -- of the actual image seen by the camera. This effectively changes the focal length of the lens, and also obscures the so-called 'principal point', which represents the precise point at which the camera was pointed when the exposure was made. Unless one has the actual negative at hand, it is often very difficult to tell exactly what changes have been imposed via the enlargement and printing process. Sometimes, if there is a lot of detail in the picture, one can reconstruct the position of the principal point and the focal length with some accuracy, and thus recover some photogrammetric information, but the photos here are of such poor quality that the exercise in this case is highly problematical at best. We also have the distinct possibility that the prints exhibited have been manipulated in various ways to emphasize, obscure or obliterate certain features. It's very common, for example to see 'retouched' photographs of World War II ships where various and sundry radar antennas, etc. have been removed in the darkroom. It's rarer -- but not unheard of -- to find that certain features have even been added. The bottom line is that unless one can examine the original negatives (or full copies made therefrom) a great deal of current analysis based on paper prints must remain what might be called, 'highly spectulative" at best. Wadinga wrote: "Antonio has refused to be drawn on whether there is any annotation on the print which can be directly linked to Langemann." Anyway no "caption" can counter solid evidences (viewtopic.php?f=1&t=8526&p=82886#p82878). Dunmunro wrote: "The first splash at 5:56 is quite probably part of a larger salvo... The 2nd splash at 6:15 is at the far left of the frame, and again it might have been part of a larger salvo..."
However, I repeat for the umpteenth time (and I would like to get an answer, soon or later): if these are Hood splashes, where are the salvos of PoW ? I remind to everybody that while Hood was firing at Prinz Eugen, PoW was straddling and hitting Bismarck with 2+/minute salvos of 3 to 5 shells... Where are these shells in a 2+ minutes Bismarck firing action scene ? Were we so "unlucky" to miss also 4 to 5 salvos fired by PoW to Bismarck, when the camera is trained exactly to Bismarck ? I would really appreciate that the only two forum members still insisting to say the contrary, at least try to answer the 4 evidences that demonstrate without any doubt that these are PoW local controlled salvo splashes (viewtopic.php?f=1&t=8526&p=82886#p82878) instead of repeating their position (supported only by second hands accounts). both captions are surely wrong mentioning the Hood and needs to be changed to PoW, despite who wrote anything anywhere. Page 15 Hits on Pow and Bismarck thread. He refused to answer whether there was original annotation on the photos and he refused to answer whether there was evidence that Langemann himself wrote any such annotation. He merely made the above assertion that whoever wrote captions was wrong, apparently based solely on his theories. He was pressed further by myself and other posters to answer these very straightforward questions but continued to refuse to do so, eventually preferring to discuss an oil painting from an imaginary viewpoint as evidence to support his theories. A number of posts were made in the intervening period the content of which would now be removed by the Moderator. Have the 4 facts now been demoted to mere evidences? Asserting the film or photos were shot at such and such a time is not a fact. It is a fact that Busch and Brinkmann identified that no shells from PoW were fired at PG. They could be wrong, but they were there and were witnesses. It is a fact that Antonio has refused to divulge any annotations or who they may have been written by.